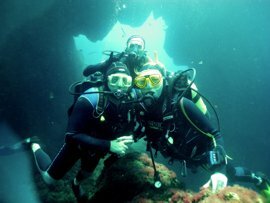 You can have lots of fun while gaining an internationally recognised diving qualification with us while you visit the Canaries. Our team is made up of experienced Dive instructors who can explain things patiently, correct mistakes positively and help you gain the self-confidence and ability to required to gain your card. Even if you have never dived before you can leave us with a unique passport to fun and adventure - a recognised diving certification from PADI (The Professional Association of Diving Instructors). 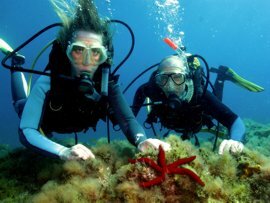 If you want to learn to dive in Gran Canaria then the best place is undoubtedly the Arinaga Marine Reserve, because here you can experience the joy of taking your diving course in an area rich in amazing marine life and variety. We work hard to make sure you get the best learning experience on Gran Canaria -It's your course, not ours! 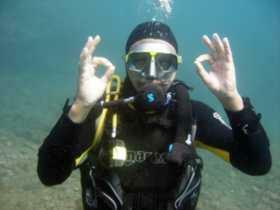 The only PADI 5 Star Diving Centre on Gran Canaria's east coast. All your open water training dives will be completed in the El Cabrón Marine Reserve, where you may see rays, angel sharks, trumpetfish, cuttlefish, octopus and much more. 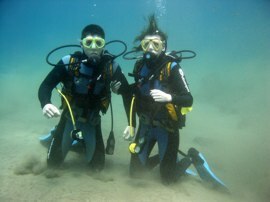 All equipment is included in the price of introductory diving courses. All transfers to the diving school included from your hotel in Maspalomas, Playa del Ingles, Sonnenland, San Agustin, Vecindario, Agüimes, Meloneras, Bahia Feliz, El Tablero. 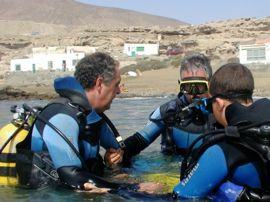 Diving courses held all year round - temperatures never drop below 18C in the water! Free Tea or Coffee throughout your diving course! Here are a small selection of divers who successfully completed their scuba diving training courses with Davy Jones Diving School in Gran Canaria. Now pick your diving course! We run a range of scuba diving courses to suit every requirement, from introductory up to advanced qualifications. Find the diving course you are interested in from the table below and click on the name to get comprehensive details of how we run that course, and what we add to make sure you get the best learning experience in Gran Canaria. Have some fun trying scuba diving for the first time, and discover the beauty of our marine reserve. Gain a qualification to dive the world from Australia to Zanzibar! Take a special course to meet a more personal or tailored need. There are few experiences that can compare with the thrill of your first dive. The mixture of emotions, the new environment, and the feeling of weightlessness all combine to make this unforgettable experience. We make it even more special by holding this dive course among the colourful and plentiful fish life in the el Cabrón marine reserve, to make your first dive a special memory. With modern scuba equipment and our careful support and preparation, you can safely Dive Today in shallow waters and yet still see some of the fabulous variety on show in the Cabrón Marine Reserve. Our day course starts with an extended introductory briefing to help calm any fears, and a special introduction to the marine life you will meet. We also have a photographer with you in the water so you can get a DVD which records how you took your first steps towards learning to dive in Gran Canaria. Safety is always our primary concern, and we help you explore the bay with no more than two students per instructor. 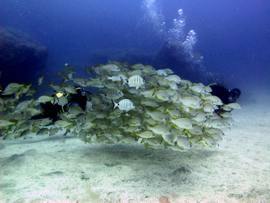 Your first pleasure dive will be in Discovery Bay in the Cabrón Marine Reserve after your briefing in our dive centre. Here you can expect to see and get close to slow moving creatures such as sea cucumbers, colourful sea urchins and anemones; as well as colourful fish such as the Turkish Wrasse, Damselfish and Parrotfish. If you are really lucky you may see some of the incredibly delicate and beautiful spider crabs, or a friendly octopus or cuttlefish. Thank you for a great time - finally got my long time wanted open water certificate - 4 days of Joy. Especially I would like to thank Brian and Annette for making this possible. You are very calm and easy both of you - and it feels safe diving with you. The gently sloping bottom, protection from strong currents and good marine life make this an excellent and safe place to make your unforgettable first dive in the sea. The sub-tropical waters around Gran Canaria are ideal for diving courses as the temperature rarely drops below 18C! When you have completed your dive you can join us on a 'double bubble' for further shallow water dives under the strict supervision and support of one of our qualified instructors. You can also use this first stage as a 'credit' towards your Independent qualification course if it is taken with Davy Jones Diving. To gain an 'independent' qualification which allows you to dive safely and confidently and to have lots of fun in warm waters without needing an instructor takes a little longer; but our diving courses covers a greater range of skills and experience to prepare you for a whole range of exciting diving experiences whether in Gran Canaria or the Red Sea. The time you spend will really prepare you well for the fun and excitement that scuba diving brings. Our instructor will safely teach you all the basics of diving in sessions at your hotel pool, followed by four or five open water dives in the marine reserve where you get the chance to put all the skills together as you master the arts of scuba diving. When you have completed your course you will be comfortable with your diving equipment, and you will develop the knowledge and skills necessary for safe yet fun sea diving. Through the pool sessions and sea dives you will progressively build your knowledge, skill and confidence so that you can be finally awarded either your PADI Open Water Diver Certification. With either qualification you can dive the world! They are both recognised universally, and will open the doors to a treasure trove of more advanced dive destinations and sites both here in the Cabrón Marine Reserve, in other parts of the Canaries or Spain, and around the world. If you have already completed your entry level diving course then you can develop your skills further with the PADI Advanced Open Water qualification). Start planning your PADI course now!